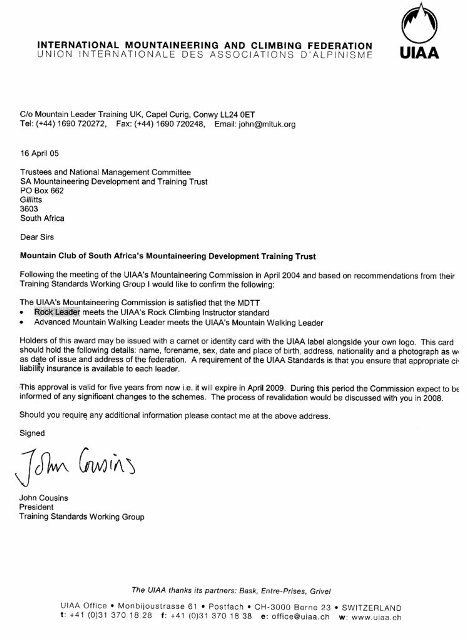 The Advanced Mountain Walking Leader Scheme provides comprehensive training and assessment in the technical and group management skills required by those who wish to lead groups in the remote mountain areas of Africa. This award meets the UIAA model standards for mountain walking leaders. The scheme offers the candidate the opportunity to gain technical competence in leading walkers. It does not provide a rock climbing or mountaineering qualification. The scheme is intended for those leading groups in remote mountainous country where walkers are dependent on themselves.